Here's the latest short film I have just made for Canongate Books. This movie will be used to promote 'Our Tragic Universe' the new novel by Scarlett Thomas. A couple of the many rotating objects I've been shooting for my latest CanonGate Books short film. As described in the earlier post, I'm using a geared down stepper motor which can be controlled from my PC (using a Stepper Bee motor controller card). My initial plan was to shoot these all these rotations as stop motion, but with motor control and the Canon 550D's HD video recording, I was presented with the opportunity to shoot these as continuous live-action. I set the motor to do just over a full rotation at quite a slow speed, knowing that I'd be able to edit and time remap the footage later... This simple rig works pretty well; super-smooth results and a bunch of time saved. For the next stop motion short film I'm currently making for Canongate Books, I found that I needed to shoot accurate rotations of many small three dimensional objects. This seemed like a good application for the geared stepper motor and Stepper Bee controller board that I've had lying around since my long-abandoned DIY film scanning project. I dug the bits out, rigged up a small stand to hold a bearing and (after a bit of fiddling about with O-rings) the stepper motor drives an 8mm threaded shaft that I can attach my objects to. The stepper motor already enables pretty fine control (it's rate at 1.8 degrees per step) but with the gearing still attached, it actually takes around 700 steps to perform a full rotation. The AutoStep software that comes with the Stepper Bee card is pretty basic but allows me to set the number of steps and duration of each step. It all works a treat, I can shoot the rotating objects in single steps (for stop motion shooting) or allow the motor to run continuously at a controlled speed (for live action shooting). Technically this IS motion control, albeit a simplified single motor rotation-only motion control. 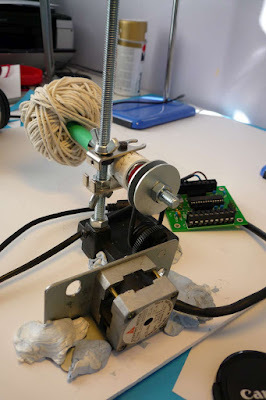 DIY Motion Control Rig: Stepper motor drives gears then an o-ring drives 8mm threaded shaft. Note the Stepper Bee card with DC power cable and USB cable to host PC.